One of my blog readers recently asked for some Sichuan style vegetarian dishes. Today’s pan fried tofu with garlic sauce (鱼香豆腐) is a great option: protein-rich tofu squares nicely golden with a little oil, then coated with a mouth-watering Sichuan classic “fish fragrant” sauce. Choose medium firm tofu if possible. Cut the tofu into squares. They should be around 1.5cm / 0.5inch thick. Remove excess water from the surface of the tofu as much as possible. Otherwise, you might end up with splashes of oil when frying. Use a clean tea towel or disposable kitchen paper to pad dry each cut of tofu. Then coat them with a thin layer of corn starch (which also enhances the golden colour of the fried tofu). Heat up the oil in a wok / pan over a high heat. Don’t slide in the tofu pieces until the oil is hot. Then turn the heat to medium. Fry until both sides are nicely golden. If frying with a traditional wok ( or a cast iron pan) which doesn’t have a non-stick surface, remember not to move the tofu until its surface crisps up. After transferring the fried tofu onto a serving plate, use the remaining oil to cook the delicious garlic sauce (aka Fish fragrant sauce, 鱼香汁). As I explained in the previous post on Sichuan shredded pork with garlic sauce, this famous Sichuan stir-fry sauce bursts with flavour: tangy, spicy, sour, savoury with a hint of sweetness. Authentic Sichuan chilli bean paste (aka spicy Doubanjiang, 辣豆瓣酱) is a fermented paste made of chilli, broad beans, salt and wheat flour. Pixian Douban (郫县豆瓣), a well-known variety, is the best choice. I suggest you avoid using Lee Kum Kee Chili Bean Sauce (李锦记辣豆瓣酱) which is very popular in the West. It contains flavouring and additives other than the four basic ingredients thus it’s not really suitable for creating Sichuanese dishes. The very last step is to combine the fried tofu with the glossy, thick, fragrant sauce and garnish with spring onion. Enjoy immediately with plain rice. You can serve it with other dishes, such as aubergine salad, Chinese potato stir-fry, Iceberg lettuce with oyster sauce, Tomato and egg stir-fry, etc., to make a tasty vegetarian friendly feast. Prepare the tofu: Cut tofu into squares of about 1.5cm/ 0.5inch thick. Pad each piece dry with a clean tea towel or kitchen paper. Sift corn starch over tofu to create a thin coating (both sides). Fry the tofu: Heat up 2 tablespoons of cooking oil in a wok (or a frying pan) over high heat. When the oil is hot, carefully place the tofu squares into the pan (Do not overlap. You might have to fry them in 2 batches). Turn the heat down to medium. When one side becomes golden brown, flip over to cook the other side. Transfer onto a plate when both sides are done. Cook the sauce: While waiting for the tofu to cook, mix Shaoxing rice wine, black rice vinegar, water, sugar and corn starch. Set aside. Add 1 tablespoon of cooking oil into the same wok. Stir fry ginger, garlic, fresh chilli & Sichuan chilli bean paste until fragrant. Pour in the liquid mixture (remember to stir well beforehand). 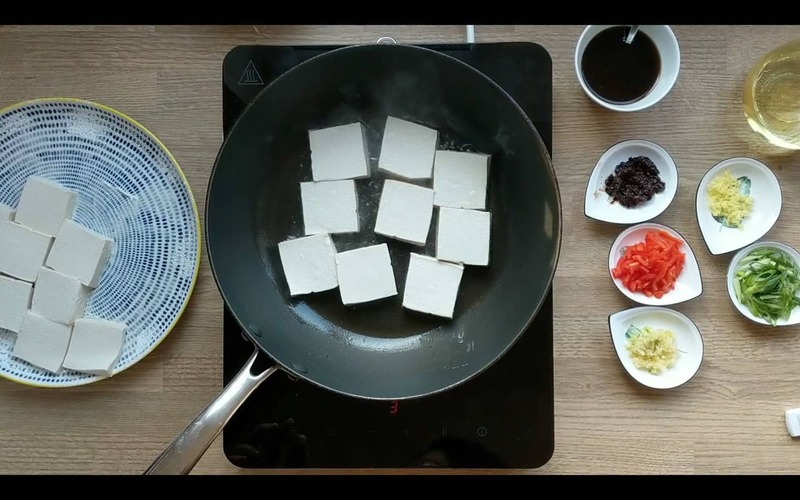 Assemble the dish: Place tofu squares back into the wok. Gently move them around. Dish out when the sauce becomes thick and the tofu is evenly coated. Garnish with spring onion. Serve immediately with plain rice. I’m never tired of eating Sichuan food! Looking forward to taste more scrumptious dishes in Chengdu, the capital of Sichuan, on my next Culinary Tour of China. Looks great, Wei!! Love the video too! Thank you Heddi! I’m trying to make more videos for my recipes. Great fun! Hi Wei, on the video, after the tofu has been fried, you stir fry the garlic, ginger, chilli and then something else which isn’t in the printed recipe. Can you tell me what this black looking paste is? Thanks, Darryl. Hi Darryl! It’s Sichuan chilli bean paste (aka spicy Doubanjiang, 辣豆瓣酱). It looks darker in the video. I wrote some info and tips about this condiment in the post. Have a look if you are interested.